You are here: Home » Meet the Flavors of Ft. Lauderdale Chefs! Meet the Flavors of Ft. Lauderdale Chefs! As one of the event sponsors, the ChefUniforms.com team spent this past weekend at the 1st annual Flavors of Fort Lauderdale event held at the Las Olas Marina. We had an amazing time learning about and trying gourmet dishes prepared by South Florida’s finest chefs. Both days kept focus on the event’s overarching theme of sustainable seafood. The chefs educated attendees about Seafood Watch® and taught them how to easily incorporate sustainable seafood in their own kitchens. On Saturday night, the featured event was Flavors After Dark with 5 fabulous female chefs all local to the area. These talented chefs all did live demonstrations to teach and engage the audience about their own unique cooking styles and expert tips and tricks. All of the fabulous female chefs looked extra fabulous in their white ChefUniforms.com #83113 women’s chef coats! The featured female chefs were Chef Lauren DeShields, Chef Shar Melwani, Chef Elizabeth Barlow, Chef Jennifer Erickson, and Chef Robyn Almodovar. Chef Robyn Almodovar appeared on season 10 of Hell’s Kitchen. She now owns her own award winning food truck, Palate Party which “brings the party to you” with a DJ and rooftop dance floor. The Flavors Grand Tasting was held on Sunday, led by the grand “Ambassador of Flavor” Chef Allen Susser. There were more live demos featuring local male chefs including Chef Alex Feher, Chef Dean Max, Chef Olive Saucy, Chef Tony Sindaco, Chef Johhny Vincencz, and Chef Ralph Pagano. 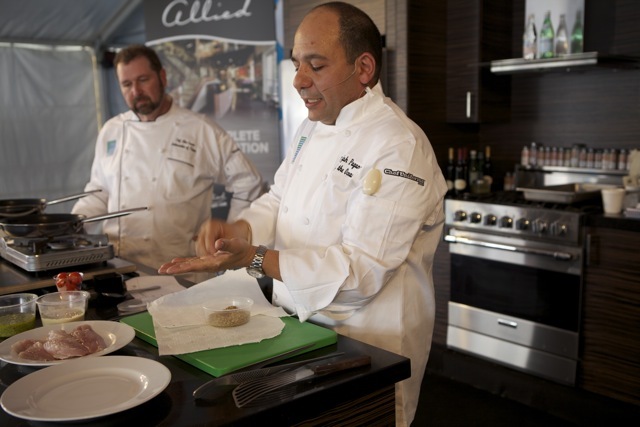 Chef Pagano appeared on the first season of Hell’s Kitchen and Iron Chef America. He now hosts the series “Pressure Cook” on the Travel Channel as well as “All Mixed Up” on the Lifetime network. Be sure to check out our ChefUniforms.com Facebook album for more pictures from the Flavors of Fort Lauderdale event!